The atmosphere is a thin shell of gas held gravitationally to the planet and having a thickness of only about 1% of the radius of the solid body. Its original composition, drawn from the solar nebula from which the Sun and the planets formed, will have included many more light elements, especially hydrogen and helium, than are found today, and a complicated evolutionary process, still not fully understood, was involved in the progression from one to the other. Key stages in the evolution of the atmosphere were the fairly rapid loss of the original atmosphere, probably in its entirety, followed by its gradual replacement by the exhalation of volcanic gases from the interior. These were supplemented to an unknown degree by an influx of volatile material similar to that which we see in present-day comets. The original loss processes were driven by radiation and particle fluxes from the young Sun, perhaps in a 'T-Tauri' phase, which were much more efficient than current levels at dissociating and driving off gases from the inner planets, although the process is still going on at a much reduced level. So are volcanic emissions and cometary infall, although again both will have been much more vigorous in the early Solar System. The emissions from the interior have probably always been of similar composition to that from modern volcanoes, so mostly water vapour, carbon dioxide, and sulphur dioxide. Comets vary a great deal in composition, but are mainly water ice with significant amounts of ammonia and methane. The nitrogen in the modern atmosphere may have originally accrued as ammonia, which was dissociated and the hydrogen content lost to space, leaving the stable N2 molecule behind. The other major constituent, O2, is of course a product of life on the planet and evolved in a very complex manner that we have yet to understand. Table 2.1 Mean composition of dry, ozone-free air (% by volume) in the troposphere. Nitrogen and oxygen are commonly referred to as major constituents; water vapour, ozone, argon and carbon dioxide as minor constituents, and the others as trace constituents. effects on the ozone distribution and as greenhouse gases in their own right. The accurate calculation of radiative transfer in the atmosphere under given conditions requires a knowledge of the concentration of the radiatively active constituents and their temperature, both as a function of altitude (pressure). In the following sections, we recap briefly the normal composition of the atmosphere, and simple expressions that describe the vertical variation of pressure (hence density) and of temperature under various conditions. A mean atmospheric composition can be defined for the main constituents that do not condense or undergo a significant level of chemical activity, and which therefore have essentially the same proportion everywhere, in the lower atmosphere (Table 2.1). As already noted in chapter 1, the principal 'greenhouse' gases are carbon dioxide, water vapour, ozone, methane, nitrous oxide and the chlorofluorocarbon family, which play a major role in infra-red radiative transfer in the atmosphere and affect the energy balance at all levels, including the surface. carbon dioxide is released by the combustion of fossil fuels (oil, coal, and natural gas), deforestation, and manufacturing, and removed by plant photosynthesis and by virtue of its solubility in the ocean. It accounts for about half of the global-warming potential caused by human activity. Principal sources of methane are landfills, marshes and wetlands, agriculture and livestock, natural gas, biomass burning, and life forms such as termites. It is removed by oxidation and photodissociation in the stratosphere. Individual molecules of methane have 20-30 times the global-warming potential of CO2 and they are accumulating in the atmosphere much more rapidly, meaning that methane could overtake carbon dioxide as the principal anthropogenic contribution to global warming. Nitrous oxide and chlorofluorocarbons are noted for their role in stratospheric ozone destruction as well as global warming. N2O originates in the burning of coal and wood, and microbial activity in the soil, and biological decay in oceans. CFCs are manufactured for use in refrigerators and air conditioners, solvents, aerosol propellants and manufacturing. Both are removed only slowly by chemical processes and rainout. 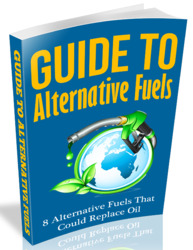 Some CFCs achieve global-warming potentials in excess of 10000 times that of CO2. To the list in Table 2.1, we must add two important species that have relatively large abundances and key roles in atmospheric processes (for instance, see Fig. 2.1), but no single well-defined value for their abundance. Water vapour and ozone are both highly variable, the former because of phase changes - evaporation, condensation, and freezing - and the latter because of chemical exchange, even in the troposphere. The water-vapour (H2O) content of the lower atmosphere varies from almost zero to 4% or occasionally more, with an average value of about 0.8%, while the ozone abundance is a few parts per million in the troposphere, rising to 0.1% in the stratospheric ozone layer at an altitude of around 20 km. 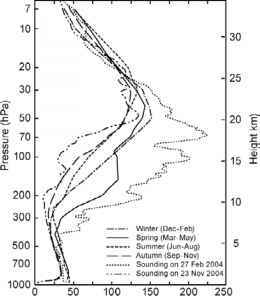 Figure 2.2 shows some vertical profile measurements of water vapour, synthesized into a global cross-section for one particular longitude and time. The extreme variability that can be seen in this data results from the sensitivity of the mixing ratio to temperature and to the availability of liquid water in cloud droplets and on the surface, plus the effects of dynamical transport. profile indicates a secondary source in the stratosphere itself, believed to be the photochemical oxidation of methane. loss processes, and to dynamical transport. Not only is the profile very variable with season, but there are also secular changes due to the build-up of man-made pollution that affects ozone photochemistry and hence the efficiency of the various sources and sinks (see Chapter 7). These changes are illustrated in Fig. 2.4, which shows two profiles at the same location obtained by averaging measurements over two twelve-month periods thirty years apart. The averaging removes most of the daily and seasonal fluctuations, and reveals the overall decline in stratospheric ozone, and corresponding increase in tropospheric ozone, driven by complex human-induced changes in ozone chemistry, even at this remote location (McQuarie Island, in the Southern Ocean south of New Zealand). 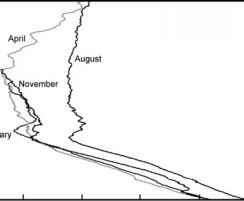 Near and within the Antarctic, the seasonal variation is particularly large, with mixing ratios in the region around 20 km altitude, where the peak is normally found, falling almost to zero. Figure 2.5 illustrates the more moderate variations that are found at midlatitudes, more typical of most of the globe. rapidly, and have absorption bands in atmospheric-window regions where more abundant species are transparent, that their contribution to greenhouse warming is not negligible, especially when looking to the future. Most of these are chlorofluorocarbons (CFCs), which are manufactured for use in refrigerators and air conditioners, solvents, aerosol propellants and manufacturing and which are removed from the atmosphere only slowly by chemical processes and rainout. A relatively common example is CFC-12 (CCl2F2), dichlorodifluoromethane, which has a global-warming potential (defined as how much a given mass contributes to global warming over a given time period compared to the same mass of carbon dioxide) of around 10000 times that of CO2 (Table 2.2). Thus, a mixing ratio of ^3 x 10~8 or about 30 ppb would be sufficient to produce a similar threat to that of carbon dioxide itself. Since R = 8.314 J K-1 mole-1 and M = 28.96x10-3 kg mole-1 for dry air H = 8.45 km at 290 K and 5.84 km at T = 200 K.
FlG. 2.6. Schematic P —T curves of H2O and CO2. Shown are the triple points and the critical points of each molecule. 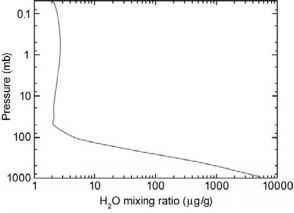 We note that the melting curve of H2O has a negative slope (so ice has lower density than water), while for other molecules it has a positive gradient and the solid phase is denser than the liquid phase. ice can melt easier with an increase in solar heating, preventing water bodies from remaining solid at depth for a long time. Also shown is the boiling point of water (100 °C), and we note that it corresponds to a water-vapour pressure equal to 1 atmosphere, i.e. the ambient pressure. There exist also a critical temperature, Tc and pressure, Pc, beyond which the molecule cannot be liquified. In this region, the molecule behaves like an ideal gas and at sufficiently high temperature above Tc the pressure and temperature of the gas are related by the ideal gas law PV = RT. The critical pressure and temperature for molecules of interest for Earth-like planetary atmospheres are given in Table 2.3. The critical pressure is defined to be the pressure that is just sufficient to liquify the gas at temperature Tc. From the table we see that N2 and O2 cannot be liquified for the range of pressures and temperatures in the Earth's atmosphere. 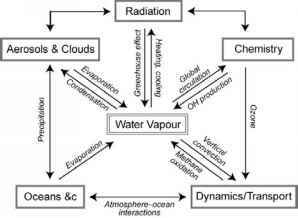 Water vapour, however, is a vapour in the Earth's atmosphere and so is a condensible gas, easily forming oceans, clouds, rain, snow or ice. For Venus, with surface pressure of about 92 bar, of which 96.5% is CO2, and surface temperature of 730 K, we see that T > Tc = 304 K, and the atmospheric temperature is sufficiently high at any given atmospheric pressure so CO2 behaves as an ideal gas. On Titan, where the surface pressure is 1.5 bar and the temperature 94 K, methane behaves like H2O does on Earth, and so it is a condensible gas that constitutes about 5% of the atmospheric pressure. On Mars, with a surface pressure of 7 mbar and temperature of 220 K, CO2 (95% of the pressure) is condensible in the phase region of vapour-solid, with triple point at To = 216 K and Po = 5.2 bar. Thus, at the Martian poles, CO2 can condense out and return back to the atmosphere by sublimation (solid to vapour phase change). Table 2.3 Triple-point temperature, To, and pressure, Po, and critical temperature, Tc, and pressure, Pc, of molecules relevant to Earth-like planetary atmospheres. We note that the triple point of H2o is 273.16 K and the triple-point pressure is 6.105 mbar without the earth's atmospheric pressure. Under the earth's atmospheric pressure the triple-point temperature of water with dissolved air becomes 273.15 K (0 °c) (e.g. Iribarne and godson 1981) and the triple-point pressure becomes 6.132 mbar. Thus, at the atmospheric pressure of 1.01325 bar, the triple-point temperature and pressure are only slightly modified. 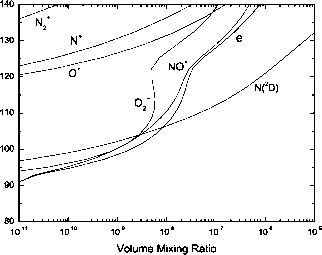 Further, we also note that if we define a critical molar volume, Vc, then the ratio RTc/PcVc does not equal unity but ranges between 3.4 and 4.5, for gases of atmospheric interest. FlG. 2.7. The mean vertical temperature profile of the atmosphere, and the nomenclature used for regions of different vertical temperature gradient. Two conventions are in common use: the classical 'spheres' separated by inflexions in the profile where dT/dz = 0, and the more modern convention which refers simply to the lower, middle and upper atmosphere. where cp is the specific heat capacity (or heat capacity per unit mass) at constant pressure. FlG. 2.8. Selected vertical temperature profiles measured by individual radiosonde balloon ascents over Scandinavia, in the months indicated, representing the four seasons. In the real atmosphere, the transition region between troposphere and stratosphere, the tropopause, is often remarkably sharp (Fig. 2.8). The nature of the observed vertical temperature profile validates the concept of the lower atmosphere as a region where the energetics are dominated by dynamics, while in the middle atmosphere radiation holds sway. Of course, the detailed picture is more complex than this. Although all but the shortest atmospheric paths are opaque to radiation on the average at tropospheric air densities, the atmosphere is quite transparent to radiation at visible wavelengths. Even in the infrared, where there is molecular vibrational-rotational band absorption (see Chapter 4), 'window' regions in the thermal infra-red spectrum exist where photons can travel from the surface to space without being absorbed. Conversely, motions occur in the stratosphere, including high winds, waves and turbulence, although vertical propagation of heat by dynamics is not as vigorous as it is below the tropopause. FlG. 2.9. The zonal mean atmospheric temperature (C) versus height and latitude, at the time of the solstice (midsummer in one hemisphere, midwinter in the other). The approximate heights of the tropopause, stratopause and mesopause are indicated by the dashed lines, showing their variation with latitude. to the energy budget of the Earth or to affect the climate at the surface. Figure 2.9 shows the latitude-altitude cross-section of mean atmospheric temperature structure at the solstice. The tropopause height varies with latitude from about 8 to as much as 18 km above the surface, being higher in the equatorial regions and lowest at high latitudes in the winter. The stratopause is warmest in summer, as would be expected since both ozone abundance and heating rate are proportional to the photon flux, but the mesopause behaves in the opposite sense, being coldest in summer. Both levels, in fact, experience large heating rates due to dynamical processes in the winter, when high circumpolar winds dissipate and their kinetic energy degrades to heat. This factor has a greater tendency to dominate in the mesosphere where the radiative heating is feeble compared to the ozone-rich, and relatively dense, stratosphere, although 'sudden warmings' of as much as 100 K or more due to the collapse of the polar vortex are a well-known stratospheric phenomenon, occurring spasmodically in midwinter. suggests that the air is saturated at the very low temperatures found just above the tropopause, even though the mixing ratio is only about 4 parts per million by volume (ppmv). The saturated lapse rate is always less than the dry value, and the ratio f can fall as low as 0.35 in a warm, humid atmosphere. where S0 is the solar irradiance at the Earth's surface and a is the Stefan-Boltzmann constant, 5.670x10-8 J m-2 K-4 s-1. 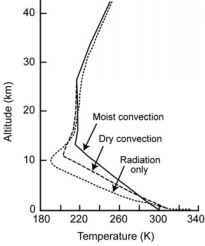 Figure 2.11 shows examples of profiles calculated according to assumptions of: (i) radiative equilibrium, (ii) dry convection, and (iii) moist convection; the last of these being the most realistic, so most measured profiles in the real atmosphere fall closest to this. Note the convergence of all three profiles in the stratosphere, where radiative balance applies in all cases. The vertical temperature profile of the atmosphere enters into radiative transfer models not only through the source function for the emission of radiation, and through the temperature dependence of the absorption coefficients, but also indirectly, through its relationship to density variations that force vertical and horizontal motions. These redistribute spatially variable absorbers such as ozone and water vapour, but are even more important for the formation and distribution of clouds, a key element in any radiative model of the climate system. The atmosphere is then conditionally stable against convection. However, if air at some level is forced upwards by an outside force such as a propagating wave, it may reach the level where condensation sets in. Then it will become unstable and continue to rise, with further condensation of water vapour, leading to the formation of clouds. The conditions under which clouds form, and the rate at which they grow, can be studied by considering the microphysics of a single droplet. These do not form spontaneously, even in supersaturated air, since the random congregation of water molecules can, at best, produce only microscopically small droplets that are not stable against re-evaporation. Instead, condensation nuclei are required to initiate droplet growth. These must consist of hygroscopic, water-soluble material, the commonest being sea-salt crystals produced by the action of the wind on waves and spray, and sulphates of volcanic or anthropogenic origin. The rate of growth of a cloud therefore depends in the first instance on the number of suitable nuclei that are available to initiate growth. 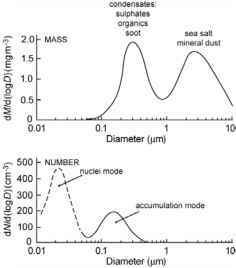 The rate at which each nucleus grows into a droplet large enough to interact with radiation (i.e. roughly of comparable size to the wavelength of the photons, or greater) depends on the relative humidity of the surrounding air, which is of course a function of temperature and therefore altitude. As unstable air rises the degree of saturation, and then supersaturation, tends to increase and to increase the rate of droplet growth. Once growth is initiated on the available nuclei, new drops will not form in a rising air parcel and the water available as vapour (effectively that in excess of the mixing ratio corresponding to saturation) is consumed by the growth of the existing particles. The classical expression for the vapour pressure pv (r) over a convex surface of radius r is Kelvin's formula where pv(ro) is the equivalent value over a plane surface, a and M are the surface tension and molecular weight of the liquid and p the density of the liquid. The constant a has the same units as r, and temperature T is taken to be constant in the vicinity of the drop. According to this, the air is always supersaturated above a small drop so it will tend to evaporate unless the surrounding air is even more supersaturated, the value required being unreasonably high. For example, to make a droplet with a radius of only 0.5 nm requires the simultaneous collision of about 17 molecules, and around 750% supersaturation of the ambient air. FlG. 2.12. 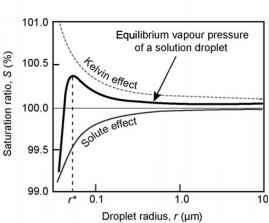 The Kohler curve (thick line) for the vapour pressure at the surface of a droplet containing solute, which reduces the vapour pressure, as a function of droplet radius, on which the vapour pressure depends inversely through the Kelvin effect. The net effect is a saturation ratio (SVP relative to a flat surface) with a strong peak at the critical radius r* for droplet growth. Once the droplet is larger than this, adding water reduces the SVP at its surface and encourages further growth, and viceversa. where pr and pare the vapour densities at, and far from, the surface of the drop and pi is the density of liquid water, for the rate of growth of the droplet at constant temperature. The numerical solution of these equations, along with the Clausius-Clapeyron and Kohler expressions, gives the growth rate of a drop under a given set of conditions. In the real atmosphere, the growth rate of a droplet by diffusion of vapour is very slow. 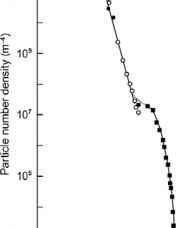 A submicrometre droplet can take many hours to grow to 100 ¡m, the size of a representative cloud particle. Droplets larger than this are prone to sedimentation, although this depends on the support offered by the vertical velocity of the surrounding air. Should the air begin to subside to warmer, lower levels, the evaporation of droplets of all sizes will occur. If, on the other hand, the air continues to rise to colder levels, continued growth, freezing and coagulation are all possible. The vapour pressure over ice is less than that over supercooled water, and so freezing can lead to the very rapid growth of small particles. Once these are large enough to begin to fall, collisions lead to coalescence and even more rapid growth, finally producing precipitation. Because freezing accelerates particle growth, a lot of the rain that reaches the surface in midlatitudes starts out as frozen droplets in clouds, that melt during their descent to the surface. Depending on temperature and humidity conditions in the air below the cloud, the droplets often may not reach the surface if the evaporation rate is high. The radiative-transfer properties of clouds depend strongly on the size distribution of the particles they contain. As the previous discussion indicates, this can be a very dynamic factor, and the best that can be done in climate models or retrievals from remotely sensed data is to assume some sort of mean or representative distribution based on statistical studies of measurements made in real clouds under various conditions. In modelling clouds the focus is generally on cirrus of moderate optical thickness at relatively high altitudes. Cumulus and similar clouds, because they are near the surface and generally quite optically thick, can generally be represented as black or grey bodies without the need to consider their detailed microphysics. The particles in cirrus are made of ice and are non-spherical, usually with at least one dimension that is large compared to midinfra-red wavelengths, typically measured in hundreds of micrometres. If these are assumed to be randomly oriented then they can be treated, obviously with the introduction of additional uncertainties, as spheres of some representative mean radius r. This allows the use of Mie scattering theory to compute the optical depth and directional phase function of model clouds relatively easily (see Chapter 6). Ice cloud parameterisations in state-of-the-art models generally use three variables, the ice-water content (IWC), the effective particle radius r, and a factor describing the shape of the particle-size distribution (PSD). The last may just be a Gaussian width or other measure of the spread of sizes in the cloud, or set to zero by adopting a monodisperse distribution in which all particles are treated as being of the same effective radius. However, measurements show that ice clouds often have a bimodal (double-peaked) distribution (Fig. 2.13) and for these, in particular, the monodisperse assumption is a poor approximation, which can lead to substantially different optical thicknesses for model clouds with the same IWC and r. PSD can also vary greatly with cloud type, height, latitude and IWC. A large number of formulae that address this problem in various ways may be found in the literature (see also Chapter 6). FlG. 2.14. Typical aerosol concentrations by mass (M) and by number density (N), as a function of the logarithm of diameter (D). Most of the mass is in the largest particles, produced by the effect of wind on dusty surfaces or on sea-spray, but very small particles (smoke, bacteria, etc.) are much more numerous. The central peak, consisting mainly of accumulated particles (for instance, sulphuric acid drops produced by chemical reactions involving gases produced from volcanoes and fossil-fuel combustion) tends to be the most important for radiative effects in the climate system, although individual situations vary greatly. incoming sunlight, increasing the albedo of the Earth, and absorb both solar and longwave radiation. Some are of natural origin, from volcanoes, dust storms, forest and grassland fires, pollen, and sea-spray. Human activities such as the burning of fossil fuels, and agricultural or industrial processes are significantly adding to the natural aerosol burden. 1. Sulphate particles, both solid (mostly ammonium sulphate) and liquid (sulphuric acid). These originate in the combustion of the sulphur content of fuels used in cars, power stations and industry, and to a lesser extent in natural processes like volcanic eruptions and biomass burning. 2. Sea-salt particles, lifted by the wind as sea-spray evaporates. 3. Fine dust, raised by winds from deserts and other dry plains. 4. Carbon particles (soot) and other organics that form the bulk of the visible part of smoke plumes from combustion processes of many kinds. Figure 2.14 shows a representative plot of the size distribution of aerosols (see also Chapter 6) that might be found under typical conditions in the mid-troposphere. Like ice clouds, a bimodal distribution is common, although in this case the reason is less elusive since aerosol particles have a number of different sources and compositions. The difference between the distribution by mass and by number is striking; most of the mass tends to be in the largest particles, but smaller particles are by far the most numerous, and hence tend to have the more important role in affecting radiative energy balance. The composition is also an important factor when considering the radiative properties of particles. Sulphate aerosols are particularly good at scattering visible light, and the buildup of these in the atmosphere is a major factor in global change, tending to work in the opposite direction to greenhouse-gas accumulation and produce global cooling. Dust and soot, on the other hand, absorb both solar and thermal infrared radiation and tend to heat the atmosphere, resulting in a net warming of the climate system. Some commonly found aerosols, such as mineral dust or weakly absorbing organic species, can either cool or warm the atmosphere depending on their particle-size distribution and their chemical composition, which is so variable it affects the ratio of absorption to scattering. Location on the globe is also important, since prevailing weather conditions affect aerosol formation and behaviour. Stratospheric aerosols have long lifetimes, measured in years and even decades, but tropospheric aerosols tend to survive only for days or possibly weeks, resulting in large spatial and temporal variability over the surface of the Earth. The topics in this chapter are introduced at an elementary level by Taylor and developed at a more advanced level by Andrews, Houghton, and Salby. The books by Wells and by Curry and Webster also include overviews of basic physical oceanography, while Rogers and Yau is a standard reference on cloud and aerosol physics. Andrews, D. G. (2000). An introduction to atmospheric physics. Cambridge University Press, Cambridge. Curry, J. A. and Webster, P. J. (1999). Thermodynamics of atmospheres and oceans. Academic Press, New York. Houghton, J. T. (2002). The physics of atmospheres, 3rd edn. Cambridge University Press, Cambridge. Iribarne, J. V. and Godson, W. L. (1981). Atmospheric thermodynamics. D. Reidel, Dordrecht. Manabe, S. and Wetherald, R. T. (1967). Thermal equilibrium of the atmosphere with a given distribution of relative humidity. J. Atmos. Sci., 24, 241-259. Platt, C. M. R. (1977). 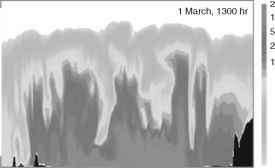 Lidar observations of a mixed-phase altostratus cloud. J. Appl. Meteorol., 16, 339-345. Rogers, R. R. and Yau, M. K. (1996). A short course on cloud physics. Butterworth-Heinemann, Boston. Salby, M. L. (1996). 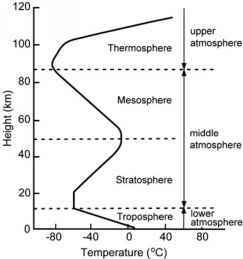 Fundamentals of atmospheric physics. Academic Press, New York. Taylor, F. W. (2005). Elementary climate physics. Oxford University Press, Oxford. Wells, N. (1997). The atmosphere and ocean: A physical introduction. Wiley, New Jersey. What important of structure and thermodynamics of atmosphere in environment?